If you asked me to give you all of the flavors of springtime in one dish, this would be it! 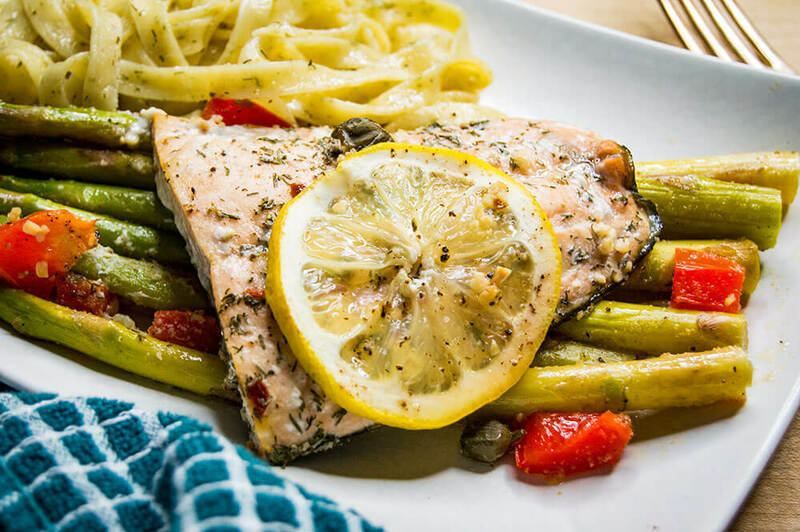 Fresh salmon filets, lightly mainated with lemon and dill and served over roasted asparagus - it's the perfect transitional dish between spring and summer. 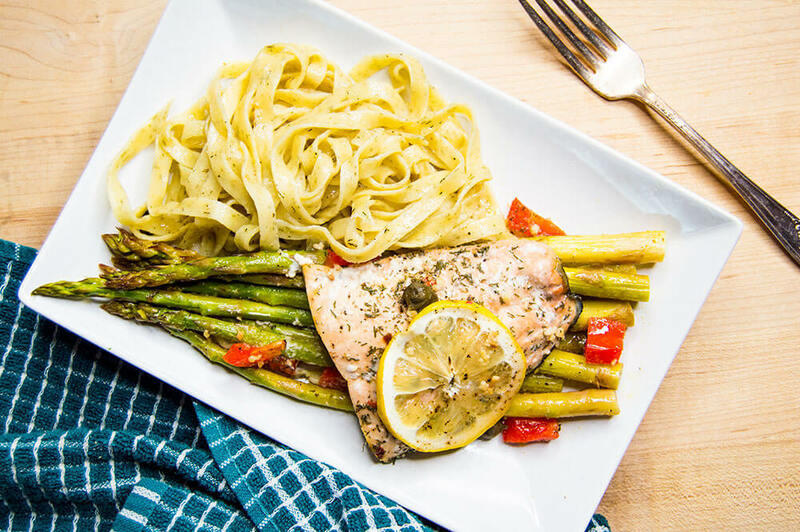 Asparagus is perfect with salmon because they have very similar cooking times - which means when the asparagus is tender and juicy, the salmon is just touching on well-done. I served my asparagus and salmon on a bed of lemon and dill Ohio City Pasta, which is a local favorite of mine, and used the juices from the pan to lightly sauce the noodles. Plus, the whole dish is actually pretty healthy so you can go back for seconds, guilt-free. In a small bowl, whisk together the lemon juice, spicy honey, capers, fresh dill, red pepper flake and liquid smoke (if using). Pour the marinade over the salmon filets and let marinate at room temperature for 30 minutes. Preheat the oven to 400 F. Trim the ends of the asparagus and arrange the stalks in a single layer on a large baking sheet and scatter the chopped bell pepper and minced garlic on top. Drizzle the olive oil over the aspargus and bell pepper. Sprinkle on the onion powder, garlic powder and season with salt and pepper. Use tongs to gently 'toss' the asparagus and bell peppers until they are evenly coated in olive oil and the seasonings are evenly distributed. 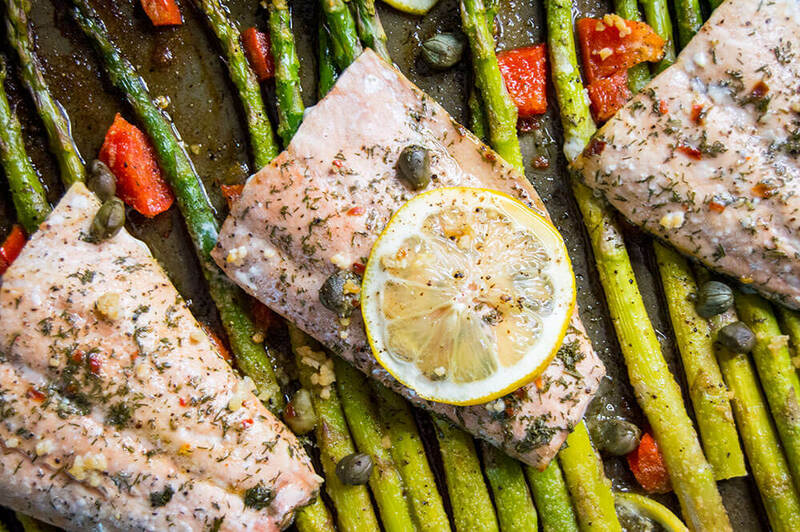 Place the marinated salmon filets skin-side-down on top of the asparagus, then pour the remaining marinade on top of the entire pan so there are capers and dill on each filet. Bake for 15-20 minutes, until the tips of the asparagus are crisp and the salmon is cooked until it easily flakes off the skin. While the salmon bakes, boil your favorite pasta according to the instructions on the box. 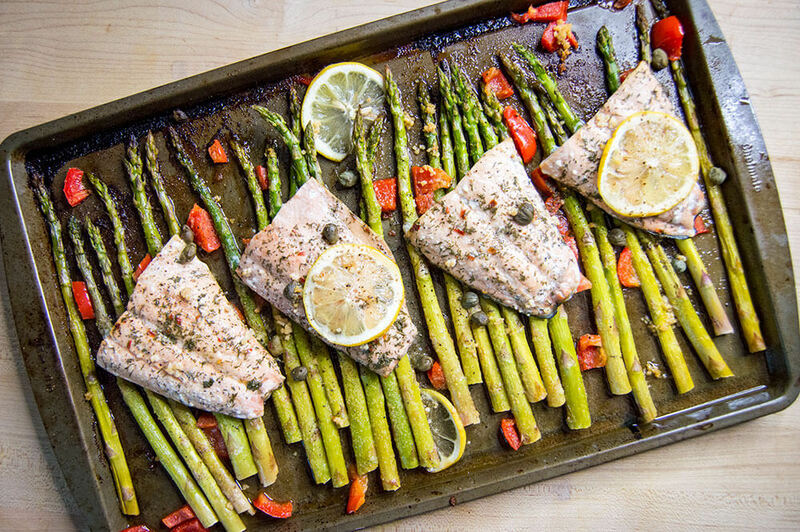 When done cooking, remove the salmon and asapargus from the oven and plate immediately. Reserve the juices on the pan and pour the juices over the cooked noodles. Serve the noodles alongside the salmon and asparagus. Enjoy!